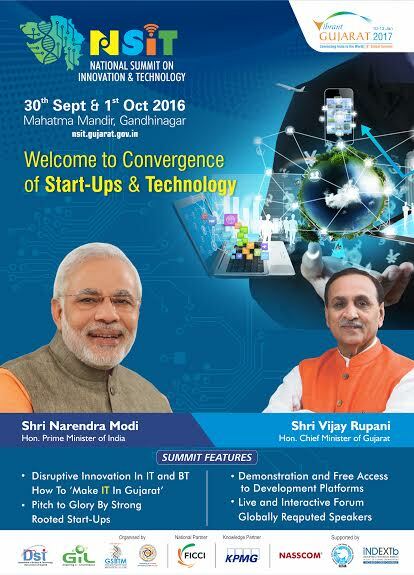 Gandhinagar: The National Summit on Innovation and Technology is organized as part of Pre-Vibrant Gujarat Global Summit 2017 by the State government in Gandhinagar at the Mahatma Mandir from 30th September 2016 to 1st October 2016. The two days Summit will commence with Bio-technology and Startups on the first day followed by IT and Electronics on the second day and expects to see participation from the leaders of IT & Electronics industry and over 400 companies from across the country. The NSIT summit will be inaugurated by Honorable Chief Minister of Gujarat- Shri Vijaybhai Rupani. The NSIT summit intents to provide an effective platform to pull in experts, professionals, software solution providers, industry leaders, academia, start-ups to participate, interact, exchange, opinions, views, discuss issues and analyze solution frame works. The agenda of addressing the real issues impacting business decisions and discussing possible solutions differentiates it from the traditional workshops or conferences. 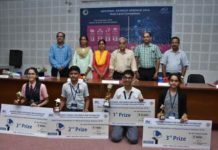 The NSIT summit will host 30 emerging startups, venture capitalists, angel investors on a common platform allowing them to make their case in front of jury seated by top industrialists of the IT/Electronics and Biotechnology industry giving the participants five minutes window to promising opportunities. The summit will also see live technology demonstration from major players in technology like SAP, Microsoft, IBM among others and an encouraging 6 month free platform access for startups and entrepreneurs of the state in addition to free mentoring and accelerator programs. The focus of the summit will be on Trending Technology -technologies on horizon, disruptive innovations- the fantastical theatre of engineering innovation and application of technologies within reach for the new age business solutions. Being divided into substantive sessions and exhibitions; it provides the opportunity to all stakeholders to focus on specific areas from their own perspective and professional experience.